“Should I put this up on a coat hanger or fold it?” If there’s one question that plagues each person who spends time arranging their wardrobe, it has to be this. And for good reason too, because taking care of your clothes- even when they are sitting in your closet – goes a long way in giving you your money’s worth! Don’t get worked up just yet; if your closet is full of different fabrics and clothes meant for varied occasions, you’ve come to the right place. Read on to know the best way to store your clothes to keep them looking as good as new for years to come. First and foremost, these are special garments, and shouldn’t be stored with your everyday clothes. You can of course, store these inside your closet, but you have to ensure they are washed clean and completely dry. Storing unclean and/or damp swimwear and activewear inside closets can not only make your closet smelly, but can encourage the growth of mold and mildew. Clean and dry swimwear and activewear can be placed in fabric garment bags and stored flat in drawers or on shelves. Do not use plastic bags as they can limit air circulation! Since these garments are stretchy, it’s not advisable to use hangers to store them. If you use these garments on a daily basis, you can consider storing them in a clothing rack. 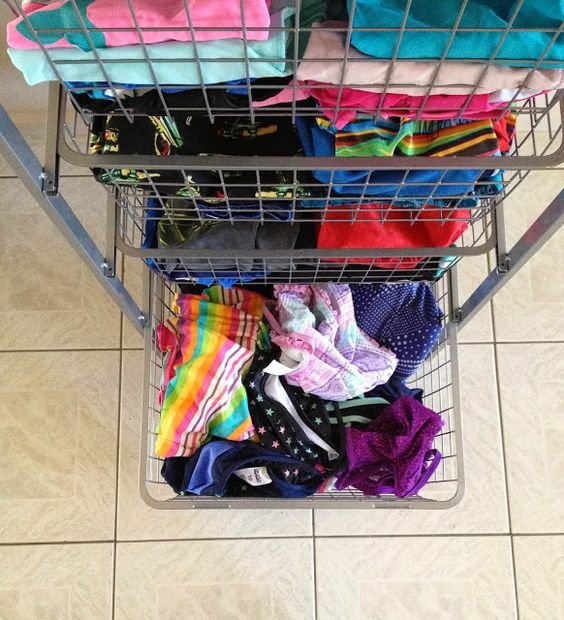 Undies and socks can be rolled and stored in drawers. You can use drawer dividers to keep the two separate. For each pair of socks, bundle one inside the other so you don’t have any missing ones. Bras can be stored on special lingerie hangers or padded bar hangers. Alternatively, use good sturdy coat hangers with notches. You can also make any hanger non-slip by putting on rubber bands on both ends! If storing bras in drawers, be sure to stack them inside each other so as to retain the shape of the cups. Carelessly throwing everyday bras and undies in drawers will also make it difficult for you to find what you want. All special clothing items like shapewear, stockings, etc. should be stored flat, separate from your regular underwear. Ideally, button-down shirts should be stored on hangers, with the second button from the top buttoned. This not only helps the shirt stay put on the hanger, but also helps avoid creases forming around the collar. Avoid using flimsy wire hangers for your dress shirts as they can cause indentations in the fabric. Wooden coat hangers or padded ones should be your go-to options! 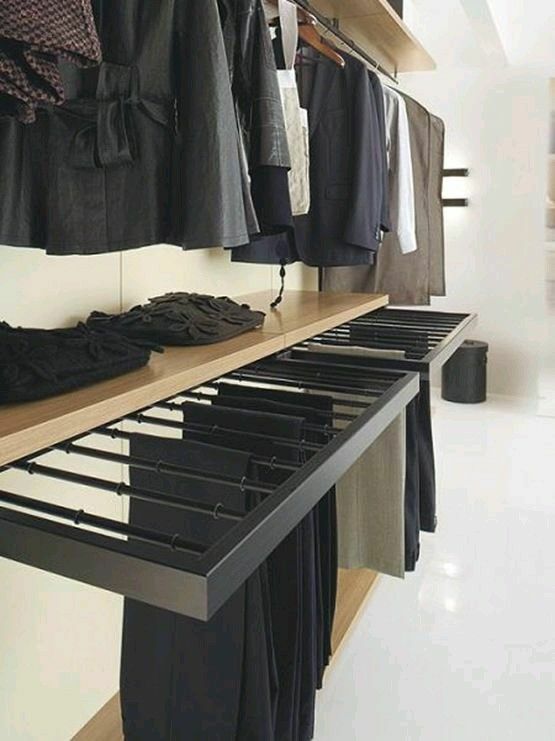 Cotton shirts and blouses can be folded and stored on shelves. Delicate fabrics that can wrinkle easily are better suited for hangers. That being said, if you have a blouse made of heavy fabric or with heavy embellishments, store it flat on a shelf so as to not misshapen the garment. The best way to store t-shirts is to fold them neatly and stack them in a drawer or on a shelf. 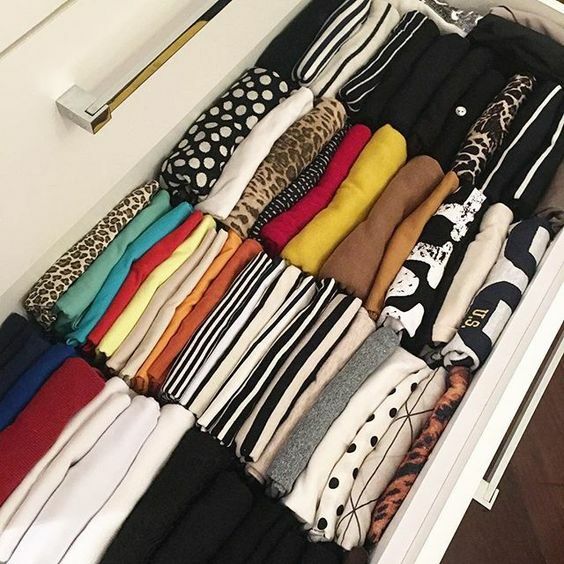 While either option will keep your t-shirts crease-free and organized, storing in a drawer gives you the ability to place them upright! This way, graphics and prints are visible, which means you can easily tell your t-shirts apart. If you have ample storage space, you can consider hanging your t-shirts. However, you’ll have to be careful to not stretch the necks of your t-shirts while putting them up on regular or coat hangers. And this can be time-consuming! So if you know that you’re likely to be pulling at your t-shirts in a mad rush to get dressed, this option isn’t for you. Chunky sweaters can take up a lot of precious space in closets, especially when they are folded and stored on shelves. As such, it’s not surprising that many people prefer to store them on coat hangers! However, hanging sweaters can cause them to stretch over time, and also develop puckers along the shoulders. To keep your knits in shape, stick to folding and storing them on shelves. If you’re worried about the creases, a good option is to roll them from the bottom up. Stack rolls of your knits on shelves or in cubbies so you can see and access them easily. If you have limited space and can only store sweaters on hangers, check out this hack to prevent the fabric from stretching! Men’s coats and blazers are bulky and can be prone to permanent creasing. So unless your coats are traveling in a suitcase – a full-length garment bag being the best option – they shouldn’t sit folded. When in your closet, coats and blazers should always be stored on hangers. Note that since these clothing items are heavy, their weight can cause them to stretch around the shoulder area. To prevent damage, use sturdy wood coat hangers for your coats, overcoats and blazers. Also, make sure pockets are empty or the garments might lose shape over time. Remember to hang coats and blazers such that they can breathe. 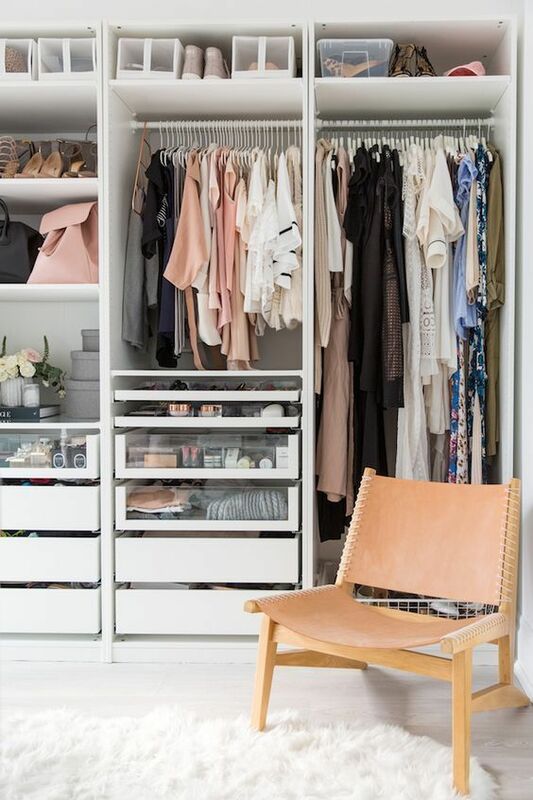 A closet that is packed to capacity might not be the best place for these garments; consider hanging them separately on a coat hanger stand or a garment rack. When putting them away for long-term storage, always get them dry-cleaned first. 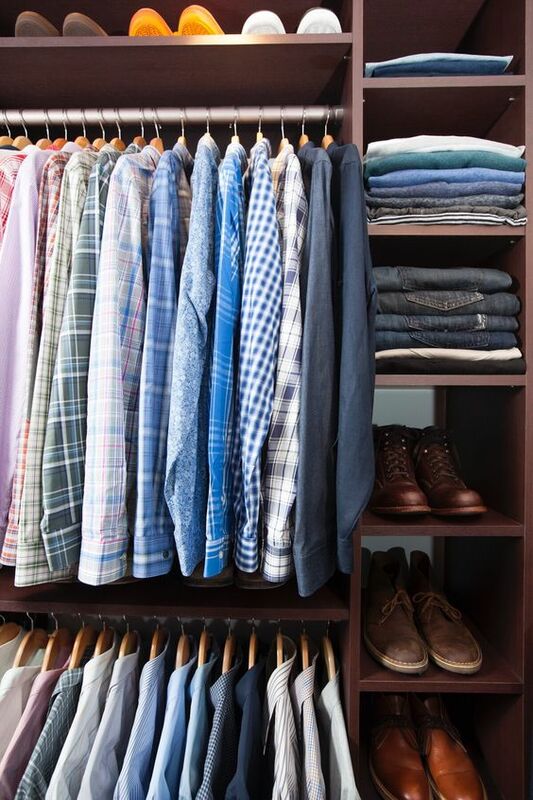 Whether you choose to hang or fold your trousers really depends on the amount of storage space you have. So always have enough space to hang clothes that absolutely need hangers, and then decide what you want to do with your trousers. If you are short on storage space, fold your trousers lengthwise in half, then twice by folding the hem toward the crotch and the waistband toward the fold created. Stack trousers on shelves or cubbies so you can see each pair easily. You can use regular hangers for your trousers as shown here or use clip hangers or multi-hangers. When storing jeans, refrain from folding and stacking pairs too tightly. Denim needs to breathe, so if your closet is overcrowded, hang your denim pants and jackets separately. Bear in mind that leather trousers must be hung from the waistband using clip hangers as this fabric can crease over time and you can’t do away with creases easily. Tuck in a wad of cloth or business cards between the clips and the waistband to prevent indentations. It’s also okay to fold leather pants lengthwise in half, and then pull the legs through a regular hanger or use a wall coat hanger. Dresses and skirts are often delicate and expensive, thus needing extra care. So make sure you give each dress and skirt its own hanger. Needless to say, wire hangers must not be considered! Use sturdy hangers for dresses, and hangers with adjustable clips for skirts. This way, you’ll be able to accommodate a skirt of any size without the fabric having to stretch. A good idea is to turn skirts inside out before hanging them up. This will not only keep the clips from damaging the waistband on the outside, but will also prevent the skirt fabric from snags as it rubs against other clothes in your closet. 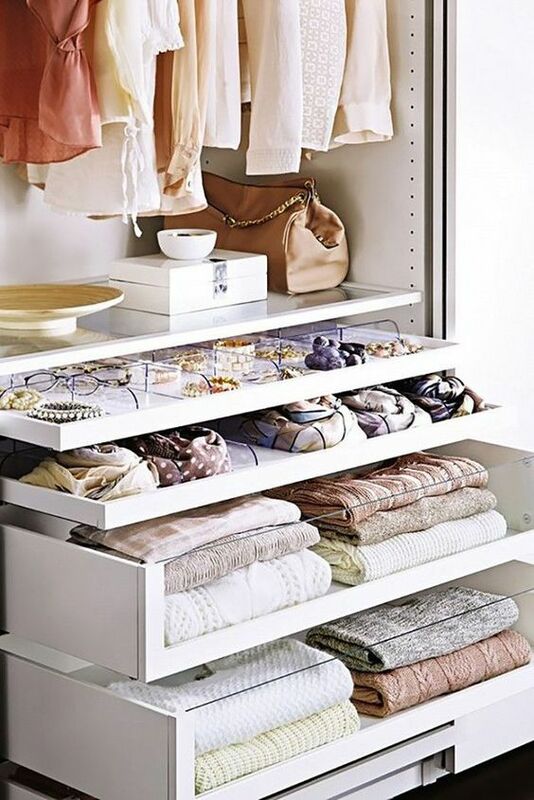 All the same, heavy dresses and skirts will be better off folded and shelved instead of being stored on coat hangers. You can also loosely bundle up flowy and embellished dresses and store them separately in boxes. And as mentioned, leather can develop creases, so avoid folding! You can’t undermine the important part correct storage plays in the life of your clothes. Storing clothes the right way not only keeps them looking their best, but also enables you to wear and enjoy your favorites for a long time. It goes without saying, this means serious savings on money spent on buying new clothes! There’s no one rule when it comes to doing what’s best for your clothes though. Just as you wouldn’t wash all your clothes in the same manner, it isn’t advisable to store two entirely different pieces of clothing in the same way. Depending on the type of clothing and fabric, each garment you own needs to be stored differently, even when it is just lying in your closet. 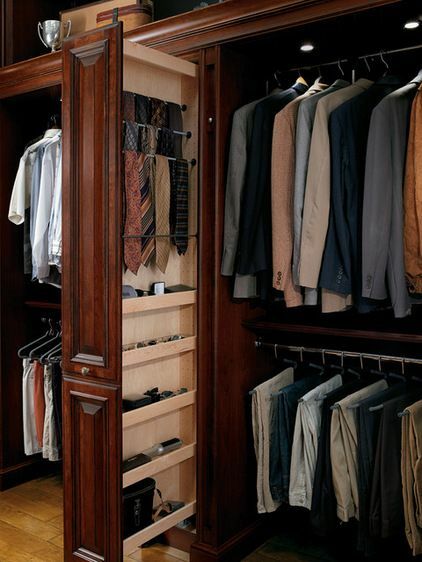 With the information provided in this post, you now know the best way to store your garments. So get started with these tips to give your clothes the love and care they deserve!